Do you want to boost your selling power? Then, add power to your persuasion. But how can you add power to your persuasion? How can you become more effective at persuading your customers to buy? Let's look at the way the skilled professionals put power into their ability to persuade. Let me share with you ten secrets I've learned from some of the most persuasive salespeople in America -- ten ways to add power to your persuasion. I call them the 10 P's of persuasion. Successful salespeople are positive people. They have positive mental attitudes about themselves, the companies they represent, the products or services they’re selling, the prospects they’re attempting to persuade, the country they live in. They’re positive about everything. Enthusiasm is contagious. When you’re excited about life and the work you’re doing, you can persuade with power, because you can get other people excited. Successful salespeople have learned to direct their persuasive power toward people who have the resources to buy and have good reasons to buy what they are selling. Professional salespeople pinpoint prospects who are likely to provide long-term profitability. They analyze the possibilities for cross-selling. They know that it takes an average of three calls to cross-sell an existing customer but seven to sell to a new customer. In short, the powerful persuader targets all efforts at the person who has the resources, the motivation, and the authority to buy, and the potential for profitable repeat sales. Red Motley, who started Parade magazine, said that the average salesperson will work like crazy to get an appointment, then blow the opportunity with a poor presentation after the decision-maker has agreed to the interview. You don’t make sales to busy people by rambling on for 40 minutes about features and benefits. Usually, after such disjointed presentations, neither the salesperson nor the prospect can summarize what’s just been said. Professional salespeople always do their homework. They know that the better they’re prepared, the more persuasive they’ll be when they walk in to make a presentation. They research to find out everything they need to know about the prospect. They plan what they will show and what they will say. And they practice, practice, practice. Amateur salespeople complain furiously when they are beaten out by a competitor. How could that customer buy that overpriced, poor-quality product? He must be an idiot! The customer was no idiot. The complainer was just outperformed by a more competitive salesperson. Remember: People don't buy; they’re sold. In fact, nothing is ever bought. Everything has to be sold. If you don't make a strong presentation, you can’t persuade your prospect to buy. Powerful persuaders are like stage actors playing to a full house. They are artists at making their presentations. They’re entertaining and informative to watch and hear. To succeed in business, you have to make every second of every minute of your “action time” count. Powerful persuaders are alert to everything that happens during a sales interview. They are not preoccupied with personal problems, with airline schedules, or even with the next call they are going to make. They know that reaching a sales goal always begins with making the sale at hand. Powerful persuaders tune into their prospects and look for the motivating forces in the life of each. Once they discover that motivating force, they play to the motivation. To add power to your persuasion, learn to read your prospects and to discover the motivations they have to buy or not to buy. Average salespeople do a lot of talking. They can give you a 30-minute speech on any subject you want to name. That's why silence is so threatening to most salespeople. 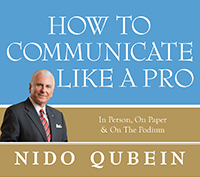 The instant a prospect pauses to take a breath, the amateur will jump in with a sales spiel, just to break the silence. But powerful persuaders use questions to diagnose the needs and concerns of a prospect much as a skilled physician uses them to diagnose the problems of a patient. They become masters at asking penetrating questions, and they use those questions to draw prospects into the selling process. The most powerful word in selling is you. The emphasis on you marks the difference between manipulative and non-manipulative selling. Manipulative selling is self-centered. It focuses on what the salesperson wants and needs. Non-manipulative selling is client-centered. It focuses on the needs and desires of the prospect. A person who is looking at the business proposition you are offering wants to know just one thing: what's in it for me? If you want to add power to your persuasion, personalize every part of your presentation to meet your prospect's own personal needs and wants. Powerful persuaders seek to close sales by pleasing their clients. When prospects become excited about the idea of owning what you’re selling, they become customers. Professional salespeople know that they can’t force their prospects to buy. Their challenge is to make them want to buy. So they seek to please them in so many ways that they create the desire to buy. Salespeople with selling savvy don't make statements they can't back up with facts. And they don't expect their clients to accept at face value everything they say. They are always prepared to prove every claim they make—to back up those claims with hard data, with test results, and with performance records. One of the best ways to persuade by proving is to give proof statements from people who are happy with your products or services. Third-party endorsements go a long way in building credibility for your claims, and for your products. Facts and testimonials are very persuasive. Learn to use them, and become a powerful persuader. · 50% of America's salespeople call on a prospect one time, and quit. · 18% call on a prospect twice, and give up. · 7% call three times, and call it quits. · 5% call on a prospect four times before quitting. · Only 20% call on a prospect five or more times before they quit. It’s that 20% who close 80% of the sales in America. You don't have to become a dynamic personality to sell. You don't have to put pressure on people, or out-talk people to sell. The most effective thing you can do is to apply your own selling savvy to these ten ways to add strength to your presentation. To master the art of persuasion—and selling—you must also learn to recognize and work with different personality types. (3) The Clams. Keep drawing them into the conversation with questions to make them talk. Ask for advice, or for their opinions. (4) The Skeptics. With the cynics, use a lot of raw data. Pour on the proof statements and documentation. Keep getting agreements as you go along. (5) The Sarcastic Souls. Sometimes they’re hard to take, but keep your cool. Find out what’s behind their sarcastic remarks. Laugh at their sarcasm ¾ all the way to the bank. (6) The Egotists. Resist the temptation to tell them off. Feed their egos by asking their opinions and giving them compliments. Win them over by giving in on all minor issues. (7) The Bullies. They get their way by acting tough. Be nice, but stand your ground. Don’t run, don’t fight—just stand. (8) The Timid Ones. Take it nice and slow, don’t rush them. Concentrate on building their confidence. You have to deal with different types of people in selling your products and services. The better you become at discovering and dealing with each of the different personality types, the more successful you can be. Remember, clients always do things for their own reasons—not for yours or mine. You’re thinking: I wish this prospect would go ahead and make a decision... I need this agreement... besides, I’ve got another appointment! But the client keeps thinking: Why should I spend this much money? Is this the best investment I can make right now? What’s the big rush? If you want to move an evasive client to action, you have to give that client a strong benefit for acting promptly. Real professionals take the opposite approach. They focus on the client’s key benefit for buying immediately. For instance, if the client’s problem is costing X number of dollars a month, the real expert will talk about how much it would cost the client to delay solving it for thirty days. It’s called “hot button” selling, and it works like this. You find the client’s primary motivation for buying, and zero in on that motivation. You keep asking questions until you find the prospect’s strongest reason for acting promptly, then you reinforce the client’s own reason. So, I always figure that, if people are not willing to do whatever it takes to get moving, I have not yet discovered and shown them what they want most. When you have done that, you don’t have to worry about pinning down evasive clients. They’ll pin themselves down. Learn how to persuade more effectively, and you will boost your selling power. Was this article of help to you?